This 157-page guide includes 42 multiuse trails and features detailed maps and descriptions of every trail. Some of the trails are quite long, and they would make good multi-day excursions, or handcycle routes; but there’s enough diversity in the guide, so you’ll find some good day trip trails too. Best of all, the trails are rated for their roughness as well as their accessibility, and the guide even includes information about the surface of the trails. Add in some color photographs and you get a real good feel for the trails from this guide. I was also impressed with the accuracy of the guide, as the Spruce Railroad Trail entry included a progress report about the completion of the paving project that will make an eight-mile section of the trail wheelchair-accessible. I also discovered a few trails that I’d like to try, including the Sammamish River Trail, which begins in Blythe Park, Washington. This 11-mile trail travels along a scenic greenway and past the Hollywood Wine District (a recommended side trip), before it ends in Marymoor Park in Redmond. There are also a number of parking areas along the way, which makes it easy to do a shorter section of the trail (probably what will happen if I spend too much time in the Hollywood Wine District). Then there’s the shorter South Bay Trail in Bellingham, Washington. This 2.5-mile trail features a short jaunt through a foliage filled area with good views of the bay, before it terminates at a Saturday farmer’s market. Like I said there’s lot of variety in the guide. It makes a good companion if you’re traveling though the Pacific Northwest, and you want to hop off the beaten path every now and then. This list price of the book is $16.95, but it’s available for $12.71 from the publisher, or you can pick up a kindle edition from Amazon for $10.99. Wilderness Press offers a total of seven Rail-Trails Guides, so check out their other titles on their website. Personally, I’m looking forward to seeing what the California, Arizona and Nevada edition has to offer. If it’s as good as the Washington and Oregon guide, it’ll be a great resource for my next road trip. 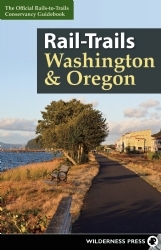 This entry was posted in Product Reviews, Recreation, Resources and tagged guide, hiking, Oregon, rail trail, trails, washington by Candy B. Harrington. Bookmark the permalink.